Update: On Wednesday, August 15th, after hundreds of Uber supporters signed an online petition and thousands voiced their displeasure via e-mail and Twitter, one of Governor Deval Patrick's communications staffers tweeted that the state was "working on a swift resolution" (and acknowledged that he'd used the service just the night before.) Later that day, Massachusetts' Division of Standards reversed its earlier position, allowing Uber to continue operating. Update #2: In September, the City of Cambridge sued to overturn the state's ruling on Uber. 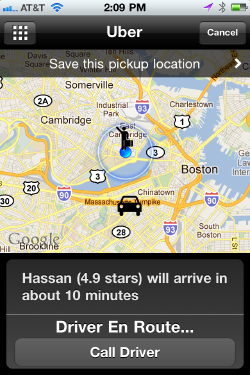 I'm a big fan of Uber, the car service that you can summon using an iPhone app. (I reviewed it here last October, just as it was launching.) So I was troubled to learn that the City of Cambridge and the Massachusetts Division of Standards want to shut down the service, contending that it is illegally using iPhones to calculate the fees it charges riders. Here's why I think they're doing the wrong thing. We live in a city with too few taxis, which happen to charge the highest rates in the entire U.S. In many parts of the greater Boston area (like Cambridge), you can't be guaranteed that a cab will accept credit cards. So Uber, a San Francisco company that makes town cars available at a higher price than taxis, but a lower cost than traditional car services, provides a really beneficial service for city-dwellers and tourists. I've used it many times when I needed a lift in a neighborhood with no taxis or cab stands, or when I wanted a more spacious vehicle to take me to the airport. (Many of Uber's fans are women, who tell me that they occasionally are refused rides by taxis late at night if, for instance, they're trying to travel from Somerville to Boston.) Every Uber driver I've met so far — about a half-dozen now — has been courteous. They're all licensed livery drivers, working as independent operators or as part of a small livery company, according to Uber. And they all seem to like being part of the Uber network, which generates additional income for them when they otherwise wouldn't be busy. Uber is totally transparent about how its pricing works. Customers receive an e-mailed receipt almost immediately after your ride is over, complete with a map of the ride. (There's never any issue with illegible receipts, or receipt printers that have run out of paper.) You also have an opportunity to rate your driver on a 1-5 star scale. The core of the argument that the City of Cambridge and the Commonwealth of Massachusetts are making against Uber is that an iPhone is not an "approved device" for use in a commercial transaction — in this case, tracking where a trip starts and ends, calculating the fare, and billing the rider's credit card. (Some of that process involves Uber's servers, communicating with the iPhone.) So essentially, if I were an independent livery driver and you asked me to take you from Wellesley to Logan Airport, I could pull a number out of thin air and say "$80," but it's not legal for me to use an "unapproved" iPhone to figure the fare. (See if you can explain to me how Boston Coach comes up with its fares, which are more than twice as expensive as Uber's.) Who decides which devices are kosher for use in Massachusetts and which are not? Only the National Conference on Weights and Measures, which is apparently not yet aware of GPS-enabled smart phones. Uber, for its part, believes that it is operating legally in Massachusetts, and Uber CEO Travis Kalanick told me earlier today that the Commonwealth shouldn't be trying to prevent his company from doing business here, given that no standards exist yet for using an iPhone's GPS system for fare calculation. "They can't enforce standards that don't exist," he said, adding that Uber's approach to calculating the distance traveled is "very accurate." Incidentally, I also asked Kalatnick whether it was a consumer complaint that spurred the City of Cambridge's recent investigation into Uber. "No," he said, declining to elaborate on who might have prodded the city into investigating. Do you have any guesses? Now, I don't want to put taxi drivers out of work. But the problem facing residents of the Boston area (and visitors) is that taxis are too scarce and too expensive. Using a traditional car service is even more expensive than a taxi, and inconvenient to boot: many car services require that trips be booked hours in advance. The status quo pre-Uber just wasn't working. And as for these "unapproved devices," four observations. First, unapproved devices are being used in commerce by players other than Uber, and government agencies have not swung into action to protect us from their ills. You can go into a Massachusetts Stop & Shop, use your mobile phone to scan the bar codes of the items in your cart, calculate your total, and then check out. You can pay for a scone and coffee using the LevelUp app (and a stored credit card number) at dozens of local coffee shops. You can take a picture of a check and have it deposited in your bank account. Should those kinds of innovation also wait for a standards body to bless the mobile phone before they can be rolled out? Second, do we want to prevent businesses from being launched (and jobs created) until the government defines standards? Should we not have allowed grocers to sell produce using scales until we had set up a division of weights and measures to certify that the scales were accurate? Third, even if the iPhone's GPS is not perfect, Uber's approach to calculating fares is at least as good as a car service driver consulting a paper map and saying, "That'll be $50." Yes, if there is a federal or state standard set at some point about which phones or what kind of software must be used in order for a transportation company to calculate distance traveled, Uber should comply with it. But for now, Uber is a much-needed addition to our city's transportation choices. The actions taken this summer by the City of Cambridge and the Commonwealth of Massachusetts smack of protecting established interests like taxi operators and livery companies — not protecting the consumer. While the legal wrangling goes on, Uber continues to operate in Boston. And I'm glad. Is Rest Devices' baby onesie, designed to monitor infants as they sleep, the cutest tech product in town? Compostable bed sheets: A godsend for college students who loathe doing laundry?